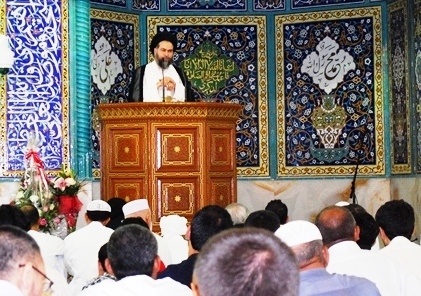 On 21st September, the Friday prayer was held in Imam Hussein (a.s) Mosque Dubai by Ayatollah Sey’yed Mahmoud Madani. The following is brief of the first sermon. In first sermon after Allah’s praise, encomium and reciting peace upon Mohammad (PBUH) and his immaculate pure and chosen family he advised and reminds himself and all the prayers to have the Allah’s virtue and obtain the characters of righteous. He started his sermon by expressing that our body cannot tolerate the hell fire. So he advised that to the same level that we can stand on the torment we should do the sin and if we are not able to stand we should take the righteous way to avoid the torment. There will be no guard to protect us against the torment but the virtue of Allah. So he prayed that Allah grants the righteous in all the moments of life to him and all the audiences as well. He asked Allah to known him and the audiences the duties and ability of performing those duties. Then he continued his previous week’s discussion about the Islamic exemplary family and explained that “As I told before, the depraved family can make the society to be profligate and the pure family will make the society to be pure.” He reviewed his talks before that if the family going to be exemplary Islamic family should have love in between of its family members. He continued that the love is obtainable and told that there are ways to establish the lovely relation in a family. The second character of the exemplary family is the accompaniment to the entire creation system. The entire creation system from the tiniest particle which is not visible the atom to the biggest galaxies is circling in their natural path as per Allah’s order. The entire world is obeying Allah and travels in its appointed path with no violation. He gave an example of a river on its downstream and if you are on a boat and sailing down in the moving direction of the river even you may not need to use the engine of the boat or use the oars and easily you will move along with the river. Now consider that you are going to sail opposite the river direction! The movement will be too difficult. If the engine stops for a second or you leave the oar you will be returned back and face too many problems. Ayatollah Madani continued that the creation system is similar to a river that streams toward Allah’s submission. If we put our soul and manner as a boat in river direction, we can easily travel in the path that Allah designated for entire creation. Peaceful life make last day’s peaceful. But if try to use the lie mean, do the guilt, these are opposing the creation system. It will make stress, adversity, divorce, fight, war, killing and whatever sometimes you can see that happens in the current time. In the current modern world which is progress pretender, the rate of divorce, massacre, and abortion are increasing. Then he explained that the successful family is the one to be in direction of the existence and gave the example that in that imagination boat you as the father are one of the oarsmen, the mother of the family she is another and the son and the daughter also all are the oarsmen. If they row in different directions rather than one direction the boat will circle and round and never will move in its direction. Now let’s look at the family inside, if the father inviting toward Allah, the mom she is doing the same and the children also are inviting towards Allah, then the boat of our family will sail peacefully toward Allah. That will be the successful family. Ayatollah Madani brought another example of prophet’s visit of just married couple, his daughter Fatima (s) and Ali-Ibn-Abitalib (a.s) the next day of their marriage. They rented a room and they had a little furniture and most of the dishes were earthenware. Prophet went to their house and visited them. He asked two questions. First asked Ali-Ibn-Abitalib that how you found your wife? Ali (a.s) answered that on my way to obey Allah she is the best assistant. (Ne’em al own a’ala ta’atellah). So Ayatollah Madani took the point that the best wife is the one assisting her husband on the way of obeying Allah and vice versa. He explained that we should help each other on this way. The man if needs to get more knowledge to guide his family on the way to Allah, he should do his best and attend in training classes, prepare desired books for his family to get them to the way of guidance. The wife should count how helpful she is to help her husband to be the Allah’s servant? So these are the exemplary wife and husband. Regarding the children also the same. We should ask how helpful we are as parents to assist them to be Allah’s good servant and vice versa. He explained that may happen a word changes the life and take someone from hell to paradise. So he brought the example of Dhuhair who was Othmani and opposing Ali-Ibn-Abitalib. At the time of Imam Hussein he was traveling the same direction of Imam but keeping himself away from his tents and trying to never meet him. But when Imam invited him, his wife noticed him that the son of prophet (PBUH) invited you and you are going to deny? This single word changed his entire life and the Othmani Dhuhair become the Husseini and joined Imam and got the greatest level as a companion and martyrdom on Imam Hussein (a.s)’s way. He is getting benefit on all praises toward Imam Hussein (a.s) and his sons and his companions. He becomes prosperous just because his wife’s word that guide him to the right way. He continued with another example of a man came to Imam Sadiq (a.s) and explained that ”I have a wife that she is very kind to me and whenever I’m leaving home she follows me till door step and whenever I return home she receipting me. If she finds me sad would tell me why are you sad, if for the life hardness, be patient and wait for Allah, he is the greatest and will arrange everything but if you are worried about the last day, no matter think more and take more care as it deserves even more.” Imam Sadiq (a.s) replied to him that Allah has correspondents on the ground and she is one of them. She will benefit half good deed of a martyr while she is alive. Ayatollah Madani expressed that “who will watch that his child is in fire and do nothing to take him out of fire? Or if his wife is burning in fire and he is just watching? Of course no one and we will do our best and rescue them. So if we compare the hell fire and the fire in our life, the hell is much harder to tolerate and why we are not taking care of our family to keep them out of the hell fire? We are taking care of their daily life essentials but forgetting their last day life?! So let’s be each other’s assistant to be rescued of the hell’s fire and be the best Allah’s servants. Ayatollah Madani continued his last section to point to the events of coming week. The first was the reminder of Imam Redha (a.s)’s birth day that would be next Thursday that will be celebration ceremony in mosque. He congratulates this event and prayed Allah to grant the opportunity of being their followers. As last part of his speech, he discussed about the newly insolence to the great Prophet of Islam (PBUH) by west and specially the Zionist that made Muslim’s heart painful. He explained that undoubtedly that was not a simple incident. “It is impossible that they don’t know the propagation of such kind of films will make all the Islamic world get angry and come to the stage. They know very well but why they did that? Although they knew that this will make the Ambassador to be killed, still they spend on that and do that? All these shows that the conspiracy is bigger than that it shows. The issue is not only a cartoon or film. They have bigger targets hiding back on these items. I just point that one of their most important target is to weaken the religious fervor. Decrease the religious sensitivity and make the insulting to saints be a normal issue. Like what they have done with Christians and they are insulting to Saint Mary but there would be no reflection or move from Pope or Christian community to oppose it, they are going to make the Islamic nation the same. They are insulting to Saint Jesus but none of the Christian countries take any action. They like to make us the same against any insulting to our saints. They like our laziness and incuriosity against insulting our saints. Ayatollah Madani expressed that the only and the best answer is to be sensitive. We took Allah as evidence in this holy place that we are weary regarding this insult, historical lie, Barbaric, anti-human, anti-literature and anti-ethic action and their defamation. We sentence this action and pray that the wrath fire of Allah took their skirt for this action and point the intrigue toward them. Thanks God that it happened and this film made Muslims aware and united. All they should know understood who the enemy is? The Shia or Sunni is not the enemy. The Muslims enemy is not Persian or Ajam. The tribes and nations are not the enemy. Enemy is the one who insults to our Prophet (PBUH) and opposes the Islam. They are giving the worst word to the best Allah’s creature. And we are so sorry that in the center of Islam, Mecca and Madina there were no movement. Those who claim to be the defender of Islam and assume Shia as Pagan are silent. Is this insulting Shia or Islam and Prophet? Why they kept silence?! Then he prayed that Allah grants the unity to Muslim world and make their heart kinder to each other and victory for entire Muslim world. Ayatollah Madani finished his first sermon and in second sermon he had his speech in Arabic.